With ZAPS® Focused Test Prep from Doorway to College Foundation, your son or daughter will experience what many parents, educators, and students consider the best ACT test prep in a timeframe that will actually fit into a high school student's busy schedule. Read about how ZAPS test preparation raises student scores in independent tests by four high schools in two states, even when all students took the test, not just the motivated, college-bound students. You can expect your student's instructor to be helpful, professional, and knowledgeable. ZAPS instructors are ACT test specialists, thoroughly trained in the ACT. 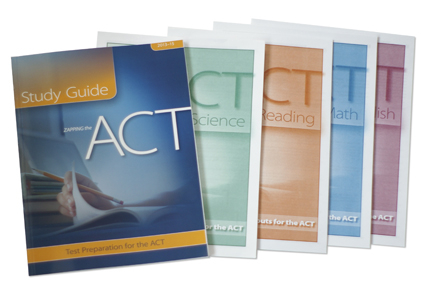 Four ZAPPING the ACT Workout booklets, with six shortened practice tests each in English, Math, Reading, and Science for a total of 24 practice tests. With ZAPS® ACT strategy webinars, your child can participate in the same, top-quality ACT test preparation as a ZAPS ACT strategy seminar without leaving home. Helpful, live customer service and tech support will be provided. If your student can't attend a live webinar, a recorded webinar is a great solution. The webinar recording is available for viewing for one full year from the date of purchase. Doorway to College's ACT Subtest-Intensive Instructional Videos™ are intended as companions to — not replacements for — a ZAPS® ACT Strategy Seminar or Webinar. The videos will be available any time for one full year from the date of purchase. 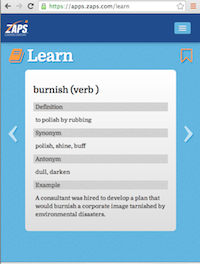 Downloadable practice materials are provided when your student accesses a video. Please print the practice items so your student will be ready for instruction. Taking the ZAPS ACT-Practice Test is a great way for your child to apply the strategies learned in a ZAPS seminar or webinar. But even if they haven't taken ZAPS instruction, the ZAPS full-length, online ACT-practice test provides important practice and study to help boost their ACT score. Learning what types of errors they make and why is one of the best ways for students to learn. 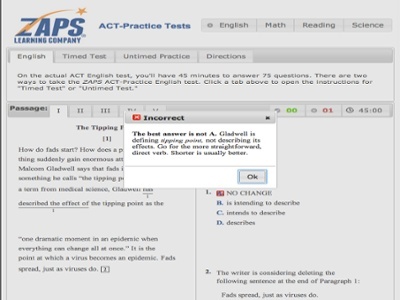 As shown below, when taken untimed, the ZAPS ACT-Practice Test provides instant access to the explanation for every incorrect — and correct — answer. When taken timed, the test provides students with a realistic estimate of the score they would likely get if they took the actual ACT on that date at that time. We encourage students to take the test timed first, so that they can see their estimated score, then take it untimed, so they can examine the answer choices and explanations in depth. The practice test will be available any time for one full year from date of purchase. The Challenge will be available any time for one full year from date of purchase.